Manufacturer: REI - Recreational Equipment, Inc. I have been looking for a sleeping pad more compact than my current one and after perusing the REI website, I decided to give the REI Flash Insulated Air Sleeping Pad a try. After checking out the specifications on the website, the Flash's mummy style, under a pound (454 g) weight, and small packed size put the Flash on the top of my wish-list. Even though my current pad is self-inflating, I decided I could handle a bit of huffing-and-puffing. The REI website provides a video on the Flash but disappointingly, it really didn't offer much insight/info beyond the website descriptions and specifications, though it did show me where the inflating versus deflating valve was located. 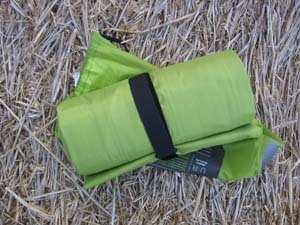 The Flash pad comes with its own lime green and black stuff sack that closes tight via a pull cord closure secured by a push-lock. Various specifications and descriptions for the Flash pad are printed on the black-colored portion of the stuff sack and inside are instructions for inflating/deflating and care of the pad. The stuff sack appears to be of quality construction with no visible flaws and fits closely to the Flash pad - so closely, I was very wary about my ability to get the pad back in once I had it out! When my Flash pad arrived, I was very excited by its light weight and small size; however, the measured size of the Flash in its stuff sack is not anywhere near as small as the listed 4 x 5 in (10.2 x 12.7 cm) on the website. My measurement was 4 x 9 in (10.2 x 22.9 cm), That's still smaller than my current - uh - former sleeping pad, so I'm happy with the size. Conveniently detailed on a sewn-in tag inside the Flash stuff sack are three sets of instructions: "To Inflate", "To Deflate" and "Caring for Your Air Pad". 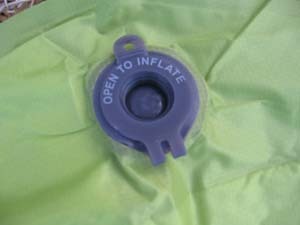 To Inflate: "Open the inflation valve and blow until the pad becomes firm. Close the valve once the pad is fully inflated." To Deflate: " Open the deflation valve. On a smooth surface cleared of sharp sticks or stones, roll (or fold) pad toward valve until all air is forced out. Close Valve." Simple instructions, but really the process is sort of self-explanatory, I think. To clean, REI recommends washing the pad by using a mild detergent or degreaser with a soft brush on a fully inflated pad after having closed the valve. After washing, rinse and let the pad air dry. Some other hints and tips are printed on the instruction tag, such as using a ground cloth to protect against punctures, not using any external pump (guess I'd better practice my yoga breathing! ), not using the pad as a flotation device and to keep the pad away from flames and heat. Should I have a senior moment and have to repair my pad, according to the care tag, I can purchase a repair kit from REI online or by phone. Removing the Flash pad from its stuff sack, I found it was secured with a hook-and-loop compression strap and a plastic cinch buckle. After loosening and removing the compression strap, I noted the pad was folded in thirds length-wise before it was rolled up. I was hoping I would be able to able to duplicate the folds and the tight roll so as to be able to put the Flash back in its stuff sack when the pad was not in use. The inflate valve was easily located at the top of the pad - the valves are labeled so I didn't really need the website video. I took a deep, deep breath and blew 29 times over the course of 1 minute to totally inflate the pad. Ta-da! The big bad wolf has nothing on me! Not bad. Not bad at all! Never mind I was light-headed and ready to lie down on that pad right then and there - which I did. Ah, it was comfy soft yet firm and I could absolutely imagine a good night's sleep. But I have to finish this report first! Deflating the Flash was simply a matter of pulling out the deflate valve at the foot of the pad and by the time I composed and typed the above paragraph (1 minute or so), all the air had escaped. I folded the pad in thirds length-wise and starting from the top of the pad, rolled it carefully and tightly to the end. On the very first try, I was able to put the Flash pad back into its stuff sack almost as neatly as it was when it arrived. I did have to take it out, however, because I had forgotten to fasten the compression strap around it before I did so. I suspect I will not bother with the compression strap once I am using the Flash pad in the field. Once less thing to lose. Oh dang! Now that the Flash has been stowed, I can't take a nap! Autumn is my favorite time of year to go hiking and backpacking with winter as a very close second. There is something very exciting about tramping and sleeping outdoors in the colorful landscape and the crisp cooling air of a Colorado Fall. 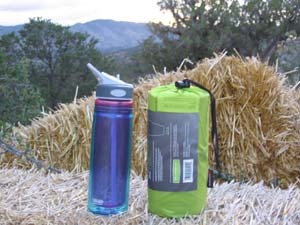 While it is still very hot here at the moment, I know the season change is right over that next mountain ridge and I am really anxious to get out on the trail and try out the REI Flash Insulated Air Sleeping Pad. I was looking for a smaller, lighter pad and this one sure is that! I love the compactness of the pad and am optimistic this will pack nicely in my backpack. On first try-out, the Flash has firmness and appears to be very comfortable. Time will tell. Over the last two months, I've had the REI Flash Insulated Air Sleeping pad out on 2 separate backpacking trips. Both of those trips took place in the Cooper Mountain Range in the Bureau of Land Management Royal Gorge area near our home in Canon City, Colorado. 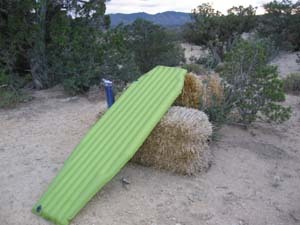 The most important aspect of a sleeping pad, I think, is how comfortable it is to sleep on. But a close second when I consider which pad to take on a backpacking trip, is how much of the valuable real estate of my pack does the pad gobble up? I mean, really. A luxury "glamping" (glamor camping) blow-up mattress is very, very cozy and soft, but I'm not going to forego my entire pack kit for that mattress, am I? So, the compactness of the Flash pad was very much appreciated when I packed it into my backpack for the first time. It's fully 25% smaller than my previous pad and that extra space came in handy on my second trip when the temperatures were predicted to be a bit colder than my sleeping bag's rating of 40 F (4 C). I was able to squeeze in a micro fleece sleeping bag liner with no additional loss of space. On my first trip out, challenged by my daughter-in-law who was able to blow the Flash up in only 12 breaths, I practiced few deep breaths and then gave it a go. I'm pleased to report after 15 dizzying exhalations, I quickly closed the valve and the Flash was fully inflated. Julia may be able to beat me at sleeping pad inflation - Hey! She's younger than me - But I'm still family Matriarch and the mother of her husband! Now, onto the sleeping experiences using the Flash sleeping pad. It's great! Oh, I have to explain why? Well, all-righty then, here goes! First off, the loft of the Flash is very note-worthy - a full 2.5 in (6.3 cm) when fully inflated. That means my sleeping bag has a very nice air space between it and the cold hard ground. This will be even more meaningful as I get into the winter months and that cold hard ground gets even colder. This amount of cushioning is very, very comfortable. Much more so than any other sleeping pad I have ever used! While I'm not exactly anywhere near as sensitive as the Princess in "The Princess and the Pea"; I have, in the past, spent many a restless night due to the one rock I missed when scoping out a tent site. I seriously doubt my "rock-clearing" skills have improved in these past couple of forays, but I can definitely say, I've slept better, thanks to the Flash sleeping pad's thick skin. Having a non-slippery surface material has proven to be a boon as well. Rather than constantly finding myself abruptly slipping off a sleeping while doing my best imitation of a wiggling worm, I am spending my nights barely aware I'm not in my own bed at home - at least as far as stability is concerned. The surface material of the Flash pad also is quieter. By that I mean, instead of loud crunching sounds as I toss and turn, it's more like a soft crinkle. As with my initial try-out, the Flash pad deflates quickly. By the time I've rolled up and stuffed my sleeping bag away and gathered together the rest of my gear, the Flash is pretty much ready to roll - literally. It quite neatly tucks away into its stuff sack every time with no fuss. I have been storing the Flash deflated but flat between trips these past two months and it looks like new still. All is well. I'm so excited about the REI Flash Insulated Air Sleeping Pad! It's so conveniently-sized for packing and set-up/take-down friendly. Best of all, it does what it's supposed to do - it "pads" my sleeping bag giving me enough cushioning for a good night's sleep after a day pounding the trails. Up to now, Colorado weather has been unusually warm - actually it's still warm, 70 F ( C) today, so I haven't really been able to judge the extent of the Flash's insulating capabilities. That will change dramatically between now and the end of the next reporting period, so I'm anxious to see how that goes. Due to a ridiculously busy work, travel and house construction schedule, I was only able to escape into the outdoors twice over the last two months. Trying to find some free time and to drag my husband away from his computer and our almost-completed house was way more difficult than any peak I've ever climbed! However, I did convince him a couple of breaks would do us a world of good and 2 days away wouldn't cause a total collapse of the economy or the roof. Both treks were local in the Wet Mountains south of Canon City and both were quick overnights - no lingering in the beautiful fall colors for me this year. Dang! The first overnight was near Bigelow Divide, elevation 9403 ft (2866 m) and the second at Hardscrabble Pass, elevation 9085 ft (2769 m). The Wet Mountains are noticeably different from other sections of the Rocky Mountains range area in that they are less "harsh", more rounded with broad valleys. They are named "Wet" for a reason and get more snow and rain than the Arkansas River Valley which lies at their base. I usually plan to go there when it's NOT wet though. On both backpacks, the weather was stellar - bluebird skies, mild temperatures, and low humidity. Nighttime temperatures were in the mid 40s F (7 C) in the early evening hours and became progressively colder into the wee hours just before dawn, down to 35 F (1.7 C) on the first outing and a chilly 31 F ( 0.6 C) on the second. Thanks to our high desert climate, the humidity never went above 30% or so at night (during the daytime, humidity is generally in the teens!). I haven't much to add to my previous comments - and if I persist in heaping praise on the Flash, my gushing will make REI's design team blush! I continue to find the Flash most favorable for a cush-y sleep and now that the weather has cooled, I don't find that nasty feeling of the cold damp ground seeping through my sleeping bag (as with some other previous pads) and stealing the warmth from my weary bones at night. I must say, I've gotten very good at inflating the Flash quickly and deflating it while packing up the rest of my gear. Stuffing it back into its pack sack can be accomplished perfectly if I take my time and fold it properly. After an overnight (or two), I've found that a light brush-off of any dirt works just fine and I haven't had to do anything more than that to keep the pad looking like new. I store the Flash at home lying flat, only putting it into the tightly rolled-up position of the stuff sack when I'm ready to head for the hills again! 1.) Inflate quickly and easily with minimal effort. 2.) Small pack size for optimal backpack space. 3.) Very comfortable to sleep on in winter conditions. 1.) Umm...try as I might, I can't think of a single thing I'd change! I absolutely love the REI Flash Insulated Air Sleeping Pad! It's compact, inflates easily and provides me with a most comfortable sleeping situation. This is by far the best sleeping pad I have ever used and will definitely be replacing my former (favorite) sleeping pad. I heartily recommend the Flash especially for colder weather conditions. This concludes my test report for the REI Flash Insulated sleeping pad, but it is certainly just the start of a long, happy relationship between me and my Flash! My sincere thank you to BackpackGearTest.org and REI for the opportunity to try the Flash out! This report was created with the BackpackGearTest.org Report Writer Version 1.5 Copyright 2014. All rights reserved.